Join us! 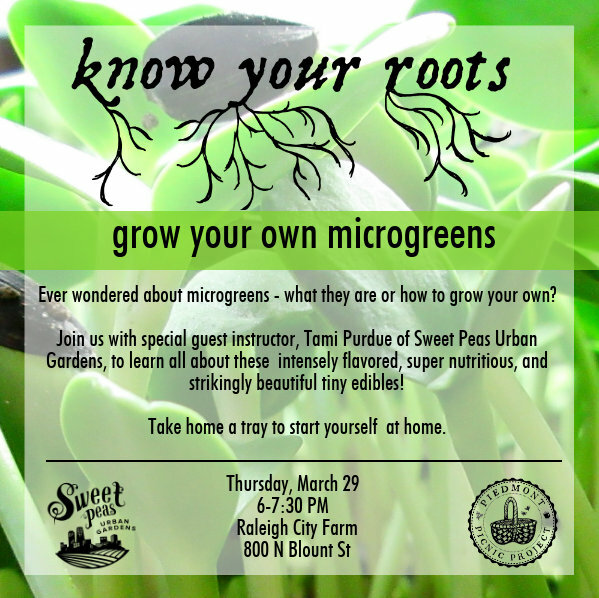 How to Grow your own Microgreens Workshop on March 29! Ever wondered about microgreens – what they are or how to grow your own? 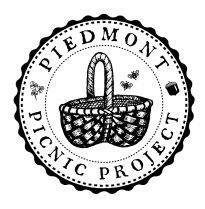 Join Piedmont Picnic Project for our upcoming Grow Your Own Microgreens workshop with special guest instructor, Tami Purdue of Sweet Peas Urban Gardens on March 29 at Raleigh City Farm! Learn all about these intensely flavored, super nutritious, and strikingly beautiful tiny edibles! Take home a tray of your microgreen of choice to start yourself at home. 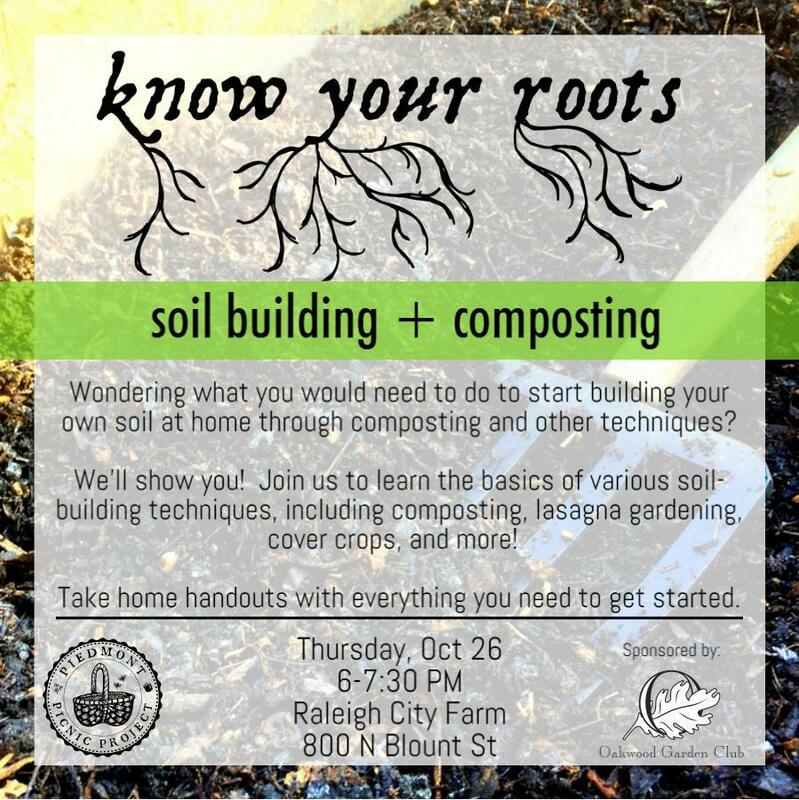 Join us for our Soil Building + Composting Workshop at Raleigh City Farm on Thursday, October 26. 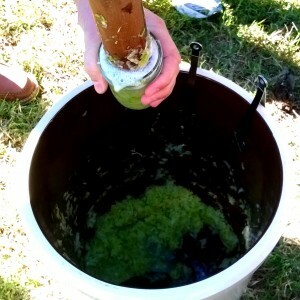 Wondering what you would need to do to start building your own soil at home? We can help! Fall is a great time to focus on building up your soil for seasons to come. 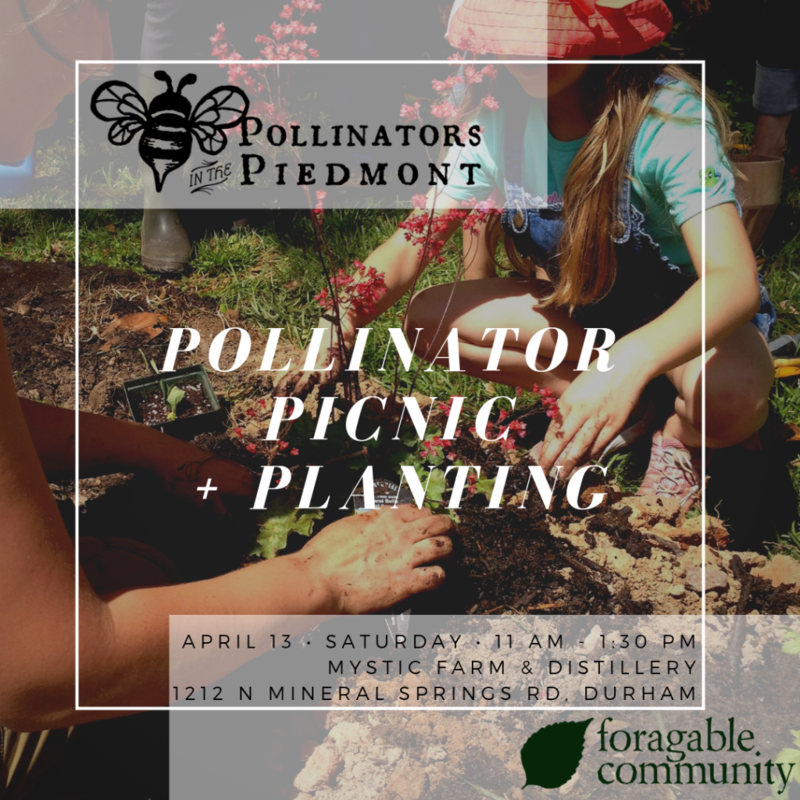 Join us to learn the basics of soil building, including composting, lasagna gardening, cover crops, and more! 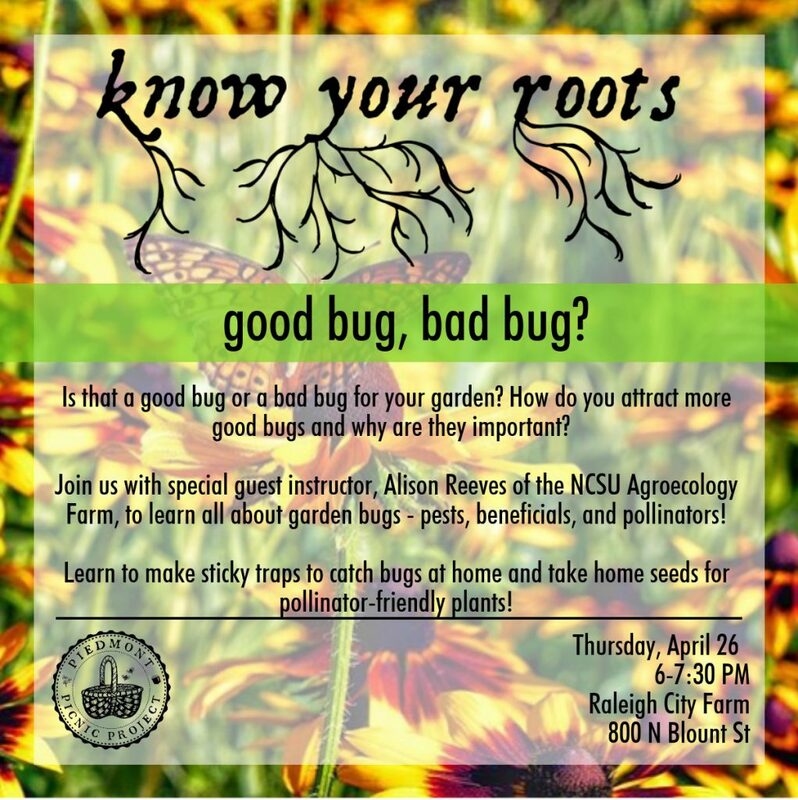 We’ll send you home with a thorough knowledge of soil-building basics and handouts to help get you started. We are able to provide tickets at this low rate thanks to the generosity of the Oakwood Garden Club. 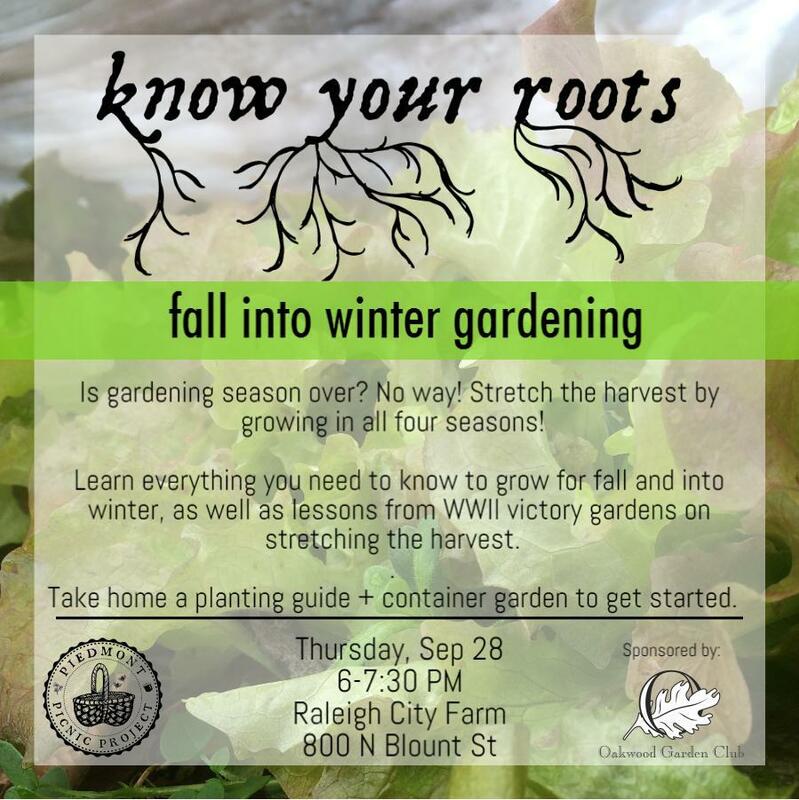 Join us for our Fall into Winter Gardening Workshop at Raleigh City Farm on Thursday, September 28. Wondering if gardening season is over now that fall has come? It’s not! Stretch the harvest and get the most out of your garden by growing in all four seasons! Learn lessons from a time in history when stretching the harvest was critical – WWII victory gardens. Go home with everything you need to know to grow for fall and into winter, with a free planting guide, AND a fall veggie container garden to get you started. 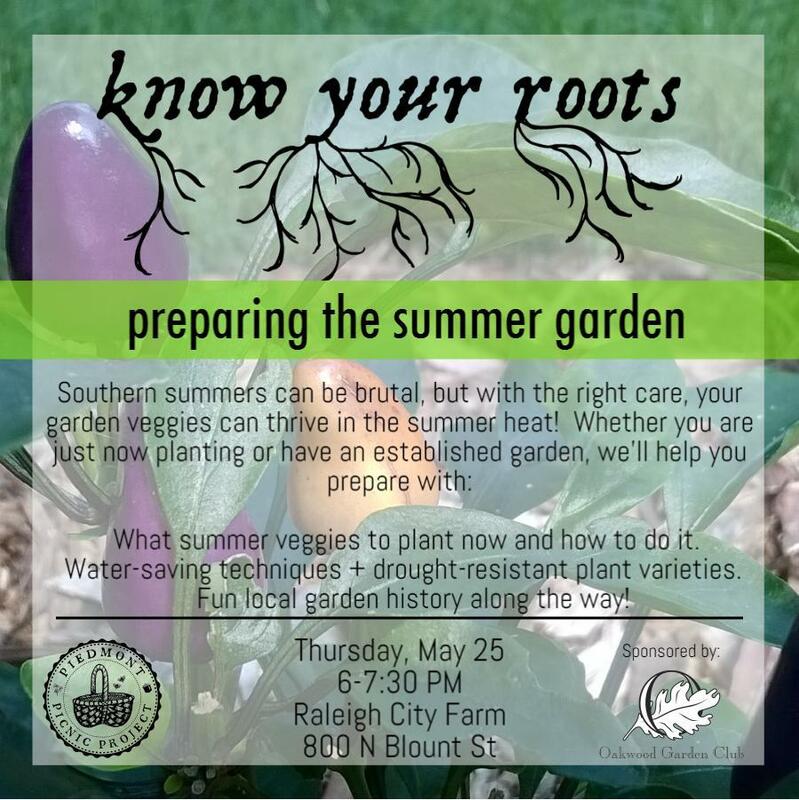 Join us for the next workshop of our spring Know Your Roots gardening series at Raleigh City Farm — Preparing the Summer Garden Workshop! Afraid you’re too late to put in a summer garden? Already planted your summer veggies, but not interested in spending the summer’s hottest months weeding and watering? Had trouble keeping your garden thriving through the summer heat in the past? This workshop is for you! We’ll guide you through everything you need to plant a summer garden and keep it going through the most brutal parts of the summer heat. We’ll send you home with a planting guide for June and a handout full of tips for a thriving summer garden. -What you can still plant now for harvests THIS summer and how to plant them. -Strategies to conserve water in your garden and plant varieties that will resist drought and thrive in heat. 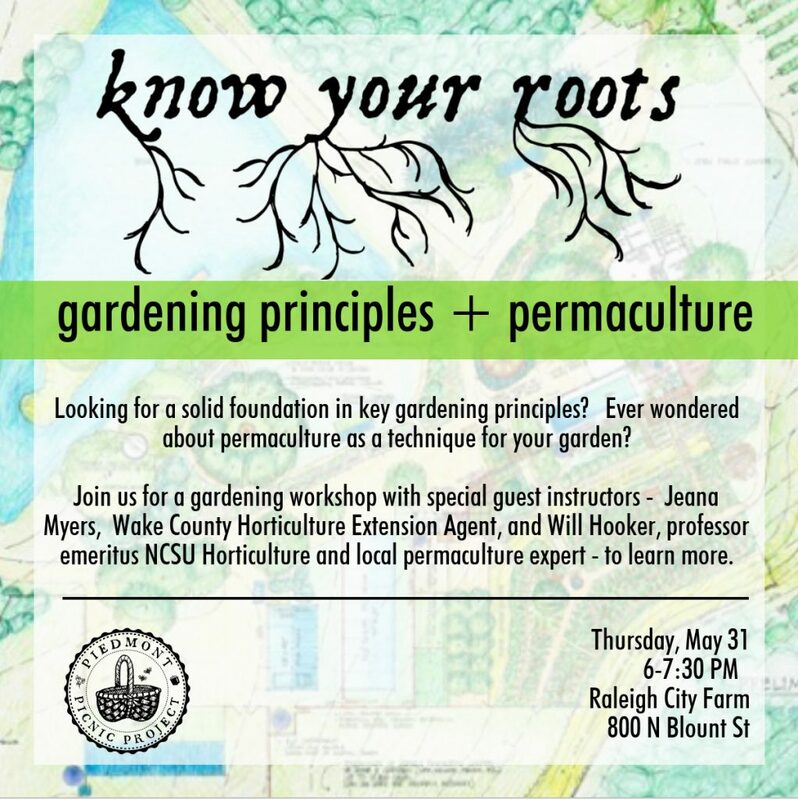 -Local history about Raleigh’s plant and garden past! This class is now SOLD OUT! Thanks to all those who signed up! If you want to reserve a spot in one of our other upcoming classes, check out our online store here. 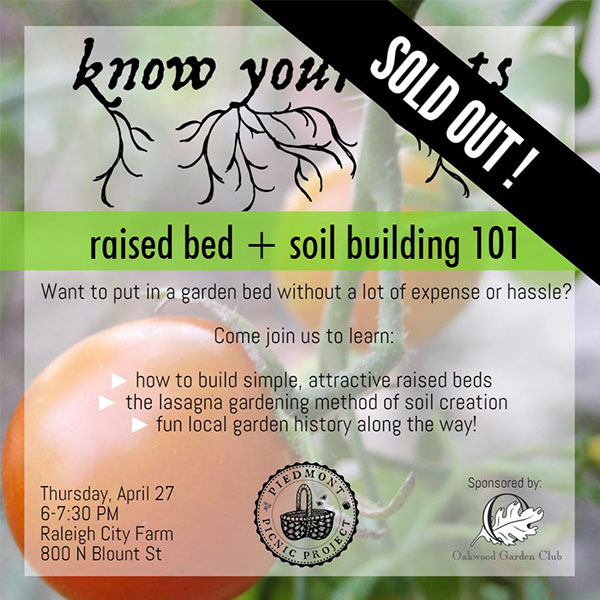 Join us for the next workshop of our spring Know Your Roots gardening series at Raleigh City Farm — Raised Bed + Soil Building 101 Workshop! Want to put in a garden bed without a lot of expense or hassle? Maybe you’re looking for simple raised bed plans or an easy way to create good garden soil? We’ll show you how to do both and send you home with plans and a handout to get you started! -How to construct a simple raised bed design using wood and galvanized metal. We’ll practice on site and send you home with plans. -How to create soil easily and inexpensively for any garden bed using the lasagna gardening method of soil creation. We’ll give you a handout to take home. -We’ll also show you how to plant finished beds with summer transplants and direct sow summer seeds.